Between 11th-21st April I re-visited the small Dodecanese island of Symi, close to the Turkish coast. I have visited the island four times previously and know it well, I even published a scientific paper on my observations there. Although this was a trip with no new species for me personally except needing decent photos of the shy Dwarf snake (Eirenis modestus) I was eager to go back in the spring since most of my visits have been in the summer when this island is one of the hottest and driest places in Greece. As always you have to fly to Rhodes and then take a boat in order to reach Symi so my first day was spent herping there with Ilias Strachinis and local islander Giorgos Pastrikos. Ilias and I then went to Symi for four days, Ilias left to return to Rhodes, and I was joined for the remainder of the trip by Carl Corbidge, eager above all to see his first Ottoman viper (Montivipera xanthina). However, the Greek Orthodox Easter and unexpected bad weather conditions look set to make the trip a difficult one, in fact 4-5 days were almost entirely wasted sitting around in the rain or waiting for clouds to clear and the sun to come out. Even by lifting stones we were struggling as it was far too damp beneath them. 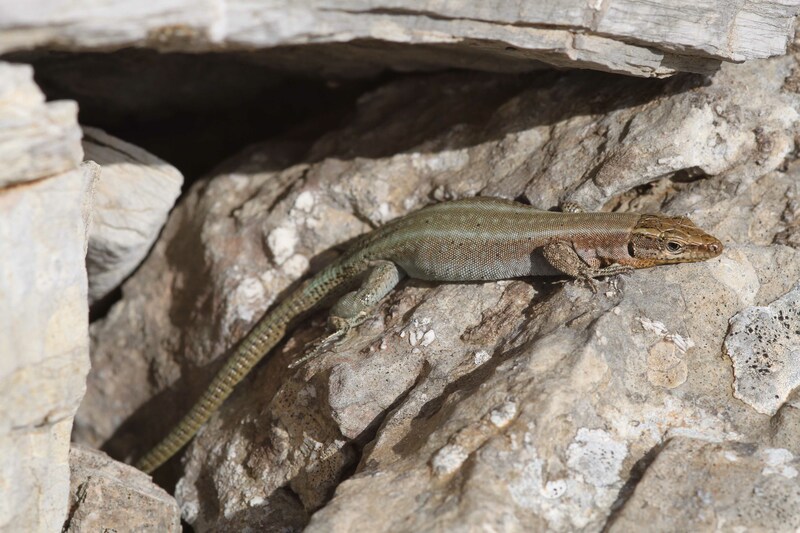 But persistence paid and by making the most of the breaks in the weather we could find 19 species of amphibians (3) and reptiles (16), 14 of these on Symi. We were especially pleased to find two Dwarf snakes (Eirenis modestus) a species which I have struggled to find on this island over the years, as well as two rare Golden skinks (Trachylepis aurata) which is extremely difficult to see on Symi. In addition we recorded a new species for Symi in the form of two flipped Worm snakes (Typhlops vermicularis), weird considering the amount of stones that I and others have turned here in the past. As always I am very grateful to my South African friends Nicholas and Adriana Shum who once again not only allowed myself but my friends to stay on their farm during our stay on Symi. I flew from Manchester to Rhodes in the early morning and arrived around lunch time where I was greeted by Ilias and Giorgos at the airport. Very heavy rain the night before but with the sun out we started searching, although a strong wind didn’t help. First observed species was an adult Balkan green lizard (Lacerta trilineata) followed by some Snake-eyed lacertids (Ophisops elegans). At a coastal olive-grove Ilias flipped a sub-adult Occellated skink (Chalcides occellatus) then I flipped a further two adults under a stone slab and caught a Snake-eyed skink (Ablepharus kitaibelli). A few Starred agamas (Laudakia stellio) and Oertzens rock lizards (Anatololacerta oertzeni) were spotted as well. At an inland stream Ilias caught an adult Balkan terrapin (Mauremys rivulata) and then I flipped a group of Green toads (Bufo viridis). Eager to see the poorly classified water frogs from Rhodes once thought of as Pelophylax cerigensis we did a short evening search. We caught one adult and a few juveniles, Common tree frogs (Hyla arborea) and Green toads were also calling all around. After this we drove to Rhodes Old Town to find a room for the night before saying goodbye to Giorgos and preparing ourselves for a 5am wakeup to get the boat to Symi. We left Rhodes at 6am and arrived in Symi by 7am where we were met by Nicholas and soon afterwards we were out searching. The weather was cloudy and quite cool, first up was the common trio which we saw every day in large numbers, Agamas, rock lizards and Snake-eyed lizards. Soon afterwards I caught another snake-eyed skink and when the sun came out we spotted the first Spur-thighed tortoises (Testudo graeca) which we also went on to see everyday. By turning stones we uncovered four Anatolian worm lizards (Blanus strauchi) as well as Turkish geckos (Hemidactylus turcicus) and Kotschy’s gecko (Mediodactylus kotschyi). In the evening we saw two large Black whip snakes (Dolichophis jugularis), chasing them from bush to bush didn’t help too much and we couldn’t catch them. Soon afterwards I found a juvenile whip snake under a stone which I did catch. We awoke to very bad weather, heavy rain and strong wind. Becoming bored we ventured out anyway to see if we could uncover any animals. Despite the fact it was soaking wet beneath stones we flipped some Agamas, geckos and a much desired Golden skink (Trachylepis aurata). The latter vanished before we could catch it, but as if by magic 5 minutes later it was back under its stone and Ilias was able to grab the much desired skink. Some Green toads (Bufo viridis) were also moving around during the daytime, with no natural fresh water on Symi they were breeding in artificial water cisterns. Even worse weather on this day, just the same lizards and Green toads. We spent the afternoon in a Greek restaurant eating, drinking and worrying that our trip would be a disaster. Finally the rain stopped, although still cloudy we ventured out on our scooter to see what we could find. In an agricultural field we found some tortoises and toads moving around then with the sun coming out we both spotted a large black snake sitting out in the long grass we which caught. A very nice adult Black whip snake with the red neck and underside owing to its name jugularis. Now with the weather improving we continued searching and I found a much desired Dwarf snake (Eirenis modestus) under a stone. Great! At a pond in the middle of a field, toads were busy breeding. Ilias then found another small whip snake under a stone. One of only two days of the trip with clear skies, no wind and nice temperatures. We set off out early to make the most of the weather, splitting up to cover more ground Ilias shouted to me saying he had caught an Ottoman viper (Montivipera xanthina) but needed some assistance. With the help of a small stick we could gently remove the viper from a stone wall and we were pleased with our find. After a photo session we released the snake and continued searching, but just before this we raced down to Panormitis monastery to pick up Carl. No time to drop off the luggage we carried on searching and in a nice field Ilias flipped another small Dwarf snake, followed by two Worm snakes (Typhlops vermicularis) a new record for Symi and Carl found a worm lizard. After photographing these species we had to say goodbye to Ilias who was going back to Rhodes and luckily for him found there a Coin-marked snake (Hemorrhois nummifer) a species we sadly failed to find this time. With not bad weather, but still windy Carl and I failed to catch another whip snake, but found all the usual suspects, agamas, tortoises etc. In the afternoon we spent some time photographing a group of around 10 Lesser kestrels (Falco naumanni) which were allowed us to sit an watch them at a surprisingly close distance compared to the kestrels in the UK. Again not good weather, but during a break in the clouds Carl caught another adult whip snake, but this one had a cream coloured neck and underside unlike the other specimen which was red. Again the same trio of lizards, tortoises and toads. Wind and rain still persistent the only new find was a birding twitch, a group of Bee-eaters (Merops apiaster) and a single Persian bee-eater (Merops persicus) very rarely recorded in Europe. The weather was being to become rather frustrating for finding reptiles! Only the second day of the trip with clear skies and no wind so we ventured out and tried to make the most of it. Lots of tortoises around, and the by climbing over a fence into a small field we found three Black whip snakes, the two adults escaped but Carl managed to get hold of a sub adult for us to photograph. As expected the weather wasn’t great, clouds still not moving away from the mountain, but we gave it a finally shot before we took the boat to Rhodes and headed home. We decided to search a remote agricultural field which was far away from any habitation and on climbing another fence we found a dried up cistern with lots of toads around but sadly with no where to spawn. While I was taking photos of the toads Carl called over ”there’s a viper here”, and I rushed over to see a wonderful Ottoman viper of a metre in length sat basking in the long grass at the side of a dry stone wall. Upon noticing us we brought the snake out into the field to take some nice photos to end our trip. Possibly my favourite snake find to date, and I’ve found a lot over the years! We watched the huge viper make its way back to its stone wall and then ventured back to town for a final search. We rescued a tortoise from the road, as the sun was finally out and saw our last snake in the form of a whip snake reversing into a stone wall. One final bit of business was to try and catch a second Golden skink we had found under a piece of wood, however sadly this time the little skink was dead beneath the wood, probably because a goat stood on it and crushed it. In the late evening we made our way back to Rhodes and thanked the Shums for their hospitality and despite the difficult weather conditions we will look back on a great trip to this small island. Overall I was very pleased with the trip, Symi isn’t after all a typical herping destination as most species, especially snakes do not occur in high numbers owing to the small size of the island and extreme lack of fresh water. I will be back again at some point for sure! I’m sure some people going to believe that I am actually going to eat the snake! Haha! I’ve lived on Symi many years but we have never met. I’m a close friend of the Shums. I’m currently growing a vegetable garden and I’m wondering if I can attract the green toad to come and eat my plentiful supply of slugs and snails. Any ideas? I must add that I have four cats and a dog. Don’t want to have them consuming any toads and leaving my veg to the snails. The only real way would be if you had a pond nearby. Usually there aren’t many toads in areas with a lot of cats but I guess four isn’t a lot by Greek standards. You could build your own pond, even something relatively small would be good. Green toads usually breed in flooded plains, these would have been found on Symi before the valleys were all cultivated so now they breed in man-made cisterns like the one in the photo. You could try taking tadpoles from a pond and raising them in your pond. Although in Symi it doesn’t really matter too much to them they do usually prefer shallow ponds no more than two foot deep. They seem to be far less abundant around Chorio these days but in some of the remoter valleys they could still be found in good numbers. I will be visiting Symi this August and staying in the harbour area. My partner and I would like nothing more than to see a spur thighed tortoise in the wild here. Do you have any recommendations for particular spots to visit, times likely to observe them or particular habitat to look out for?